20AUD, really cheap, and the guy knows his stuff. I highly recommend this guy if anyone needed anything in this area. From there we crossed into Spain, we were waved through at the border, but plenty of cars were being searched for taking out more than their allotted amounts of grog and smokes. It looked like the searches were pretty thorough, cars with all doors and boots open, one had the door trims out. I wanted to get out of the mountains, away from the storms that build up every afternoon, so we headed for the coast following the Ebre River between two mountain ranges, and storms were building up on each side of us. We managed to stay dry, and went down the coast to St Carles, where we got a campsite on the beach for 20 Euro, with power. (we needed to charge our Sennas, and cameras.) Dinner was a cooked chook, fresh bread, and salad from the supermarket, along with some of our Andorran scotch.A storm blew up during the night, but we only caught the edge of it, and the tent was dry in the morning. It wasn't a big ride down to Alicante next day, along good roads, but it was hot, around 32 deg, according to the digital signs that were in the towns we went through. The country reminded me of Mount Isa by the sea, dry, dusty, and stoney, but with big mountains in the background. We found the apartment OK, and were soon checked in to our home for the next 2 weeks. couple now living in Benitachell north of Alicante, so we rode up and met them for lunch at a great little beachside restaurant, made a good day. We rode up to Altea via Benidorm (Britain by the Sea), a few days later and met them again to see the Moors and Christians parade, a great night, and a spectacle well worth seeing. These parades happen in towns all over Spain, and they put a lot of effort into the floats and costumes, and there is usually fireworks as well. Typically they party on till early hours of the morning. We lasted till around 1.00 am, then retired to our tent at the campsite, as it was a couple of hours ride back to Alicante. 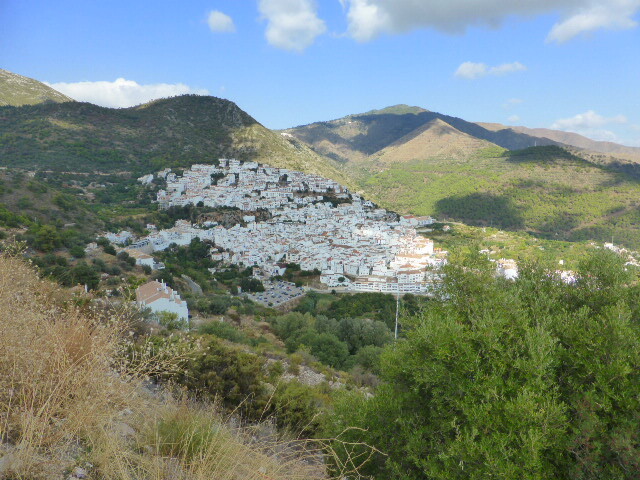 The next morning, we went inland, the long way back to the unit, via Guadalest, in the mountains behind Altea. More terrific roads through the hills, and we stopped at a motorcycle museum on the way, all the bikes have been beautifully restored. We also visited the harbour at Alicante, they are the starting point for the Volvo round the world yacht race this year, and most of the boats and crews were there preparing for the start. There is a museum on the race there also, going back to when it was called the Whitbread round the world race. Lyn with Jose and his wife in Granada. 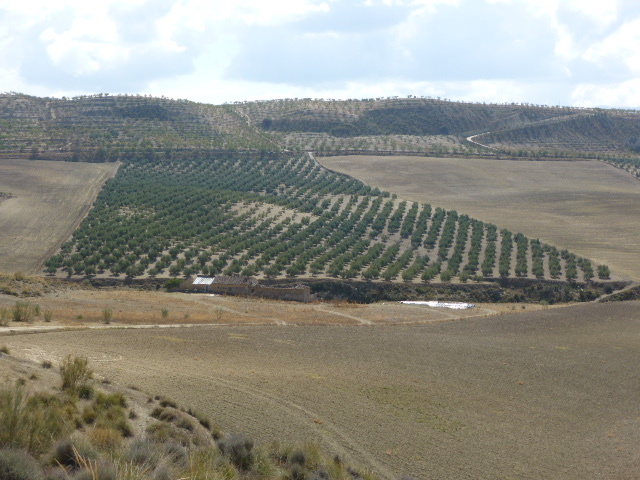 With everything all packed up again, we headed off to Granada, about 360 kms away, mostly via the main road. While it was quite scenic, it looks like most of the country has lost all its topsoil, leaving rocky gravel, with not much growing. It did get greener the further west we went, where they have more rainfall. In fact, as we got closer to Granada, there was a storm brewing, so we booked into the Ibis Budget hotel, and got unloaded just as the storm hit, and it started hailing. We had been contacted by Jose on the HU community, and he and his wife picked us up and took us out for a really nice italian meal, thanks guys, it was a great night. We took backroads down to Velez-Malag, along some great riding roads, good surface, lots of hairpins, great views, the full package. 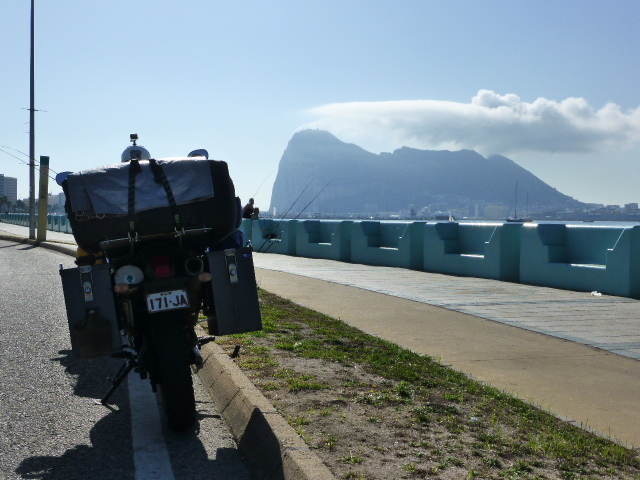 There was some highway riding to Malaga, Marbella, then Estepona. The price of fuel is around 1.42 Euro, about $2.04 AUD, much cheaper than the UK, around $2.80 AUD. The weather was building up again, so a stop at Maccas to use their Wi Fi for some local accommodation, and found an apartment cheaper than a hotel room. We had no food with us, but as it is a tourist area, we had fish and chips served by an english waitress at a cafe that had mostly english people in it. Little Britain! trip to Morocco. Over a pizza and some liquid refreshment, Peter passed on a lot of invaluable info on Morocco, also suggesting we leave from Algeciras, not Tarifa, and go to Tangier Med, not Tangier, as the new terminal at Tangier Med is still free from the touts that hound travellers going through the old port at Tangier. 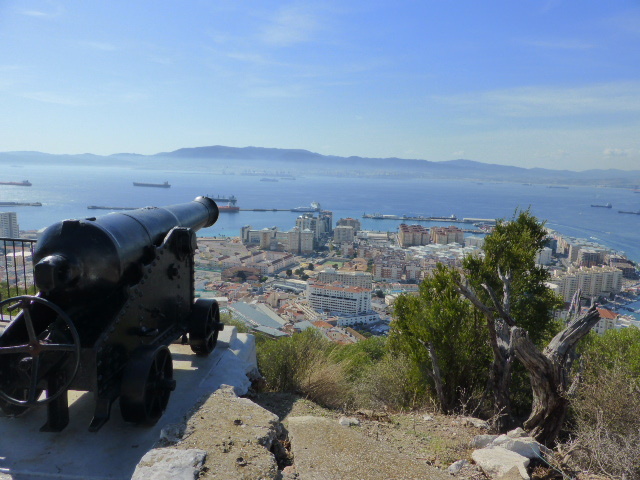 It is well laid out, and things normally go a lot smoother, so we took his advise and decided to head back to Algeciras the next morning. The weather held, no rain overnight, and we slept fairly well, by now quite comfortable in the tent.